Their certificate has not expired by more than 3 months (prior to the new course start date) AND they have attended the first aid annual “refresher training” during their certification period. If the above criteria is not achieved then the full 3 day course should be taken. Please note that the HSE state “If the first-aider does not retrain or requalify before the expiry date on their current certificate they are no longer considered competent to act as a first-aider in the workplace”. 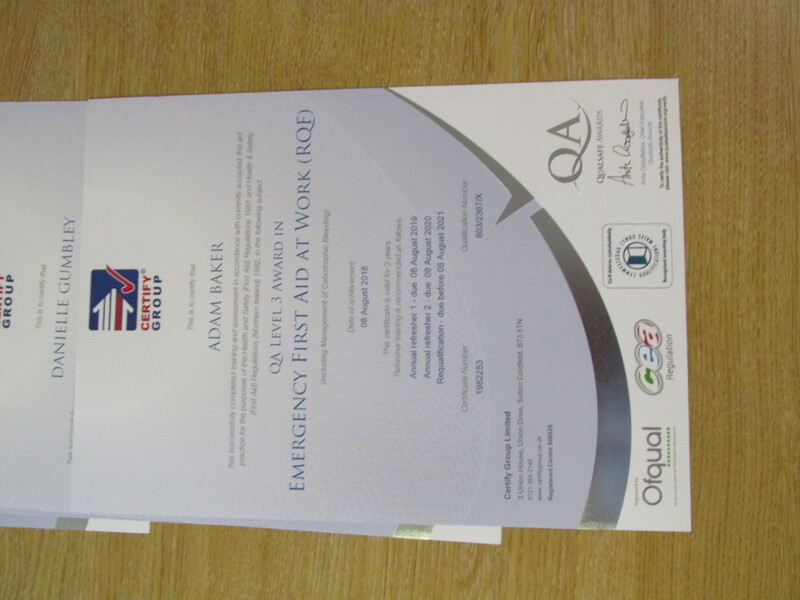 Please see this link for Calculation of First Aiders required for your company. First Aiders holding an Emergency First Aid at Work certificate, should re-attend a 1 Day Emergency First Aid at Work Course to requalify. “*With the recent changes to the HSE First Aid at Work Regulations, we advise employers to review their first aid requirements in order to ensure the most appropriate training option is selected. Those holding a Paediatric First Aid certificate (to Ofsted requirements), should undertake the Level 3 Award in Paediatric First Aid in order to requalify. Please note that the Level 3 Award in Paediatric First Aid was introduced on 1st September 2014 as the replacement to the Level 2 Award in Paediatric First Aid. The dates of our scheduled courses are regularly updated and are available on-line via the ‘Courses’ at the top of the page. Please contact your first aid training organiser at work with these dates if he or she usually arranges the courses. Due to the wealth of evidence on the severity of ‘first aid skill fade’, from Oct 2009, the HSE now recommend that First Aiders and Emergency First Aiders attend annual refresher training. 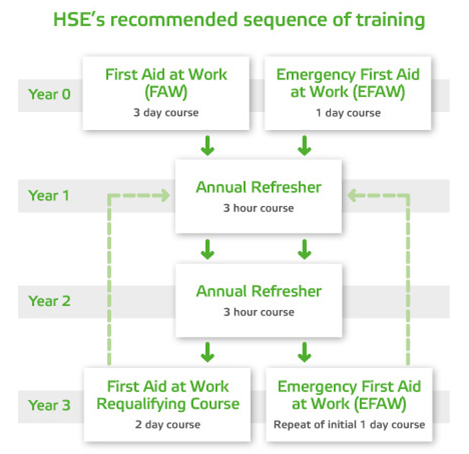 The flow chart below shows the HSE’s recommended sequence of training. *Please refer to certificates supplied for renewel/refresher information. If you want further help or advice please contact us in the first instance. Examples of fake accreditation are often found. A good way of checking is finding if the certificate supplier is registered with a regulated company or awarding body has goverment approval as an awarding body. Certify Group has certificates that state who we are an also have details of OFQUAL and they will also carry date of when awarded and requalification date also. See image below.